In the picture: former European champion Roberto Toninelli in action in Lonato's free practice ahead of the 42nd Trofeo delle Industrie (Ph. Davide Pastanella). Great interest in KZ2 with the last minute entry of Roberto Toninelli with Birel Motorsport and Jorrit Pex with CRG Holland. The 42nd edition of the Trofeo delle Industrie of Lonato will feature 49 drivers in KZ2, 26 in KF2, 37 in KF3 and a full pack of 30 drivers in 60 Mini. Engines have been switched on at the 42nd Trofeo delle Industrie, with free practice featuring a good number of drivers – an entry list of 142 drivers including several champions – that are ready for the challenge at the Circuit South Garda Karting of Lonato this coming weekend. Late entry n KZ2 for the former European champion Roberto Toninelli who came to enrich an entry lot of 49 drivers in the blue riband series. 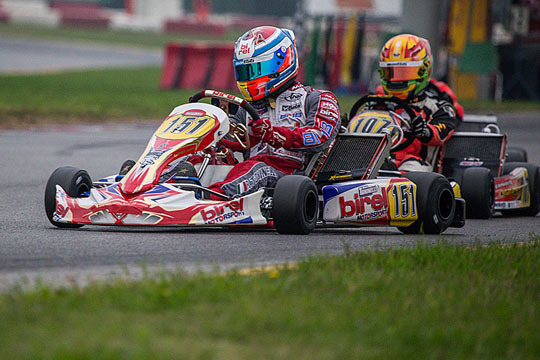 The Birel Motorsport's works driver has been protagonist in the last KZ World Championship held in Varennes and in Lonato he will have to face one of his main rivals in the recent years, the four times world champion DavideForè, who will race on the CRG-Tm run by the Polish team DTK. The strong Dutch driver Jorrit Pex, in force at CRG, joined the challenge as fresh winner of the German Championship and KZ1 European Champion and 2012 WSK Euro Series Champion. Among the favourite drivers of this race Marco Zanchetta on Maranello-Tm and the Croatian driver Kristijan Habulin who won the Andrea Margutti Trophy early on in the season on CRG-Modena. The quality of drivers involved in this 42nd Trofeo delle Industrie is therefore very high, with several champions in all the categories, as in KF2 where the presence of the British driver Callum Ilott of Chiesa Corse shines as well as that of Stefano Cucco, who won the last round of the Italian Championship. In KF3 eyes will be on the two brothers Alessio and Leonardo Lorandi racing for Baby Race, as well as on the European Champion Lando Norris of team Ricky Flynn. In the always unpredictable 60 Mini among the most awaited drivers the Malaysian in force at Gomoto Abdul Gafar Muizzuddin, who will have to face the always competitive Leonardo Marseglia and Nicola Abrusci together with his team mates. The programme of Saturday 9th November features qualifying from 10.20 (GMT+2) and will then continue with qualifying heats from 12.40. Repechage races for KZ2 and KF3 will follow on Sunday 10th November from 10.30. KF2 Prefinals will start at 11.20, while 60 Mini's ones will follow. Drivers presentation at 12.45, will proceed the KF3 Prefinal at 13.30 and the KZ2 Prefinal at 14.10. The Finals will start at 14.40 with KF2 first and then KF3, 60 Mini and KZ2. Prize ceremony will close the weekend at 17.00.